A computational study of supersonic flow past blunt bodies in the presence of energy deposition localized in very small regions of upstream flow is carried out. 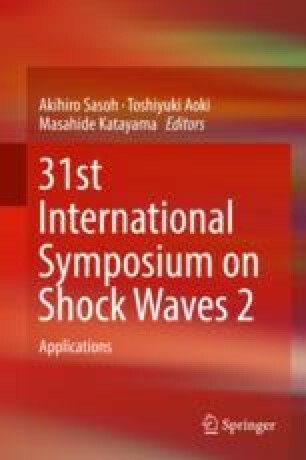 The effect of front separation zone formation due to the interaction of a bow shock wave and a shock layer with “thermal spike” (a high-temperature wake downstream of the energy deposition region) is investigated. The universal similarity condition for effective wave drag reduction of bodies due to localized energy deposition and front separation zone formation is determined. The investigations were carried out according to research plan of the Institute of Mechanics of Lomonosov Moscow State University with partial financial support of Russian Foundation for Basic Research (projects 16-29-01092 and 18-01-00793).